Commissioner Andy Vonada got it all off the ground, with the help of the PRU’s Eric Pittelkau, laying all of the foundations to start the Fort Hunt Rugby program, convincing FHYAA to sponsor us and add another sport to the Associations portfolio (big-time thank-you). 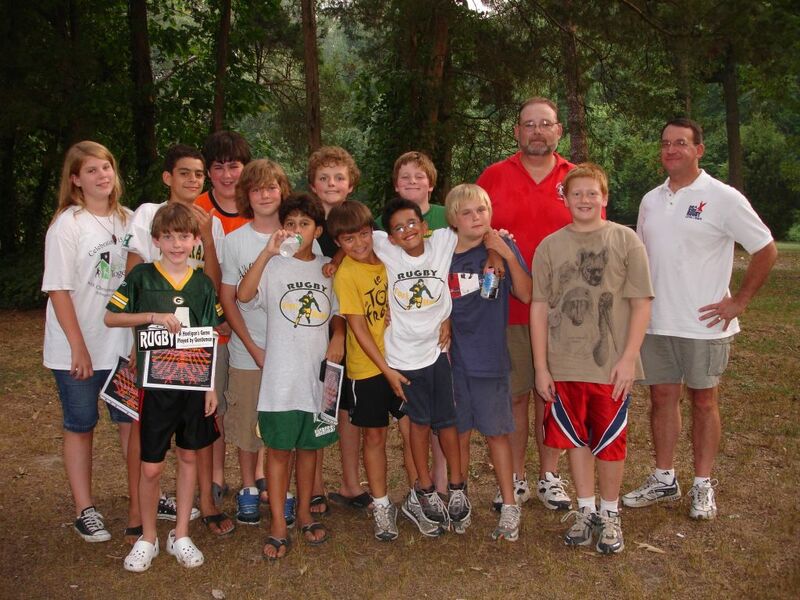 In early 2006, John Dacey heard about the program, asked to be part of it, and we were off and running, with Andy doing the budget, admin and field scheduling, and John doing the coaching, equipment, uniforms, communications/PR, etc. Our first season saw about 15 kids to begin with, and we finished with 11 dedicated touch ruggers, most of them in the U-11 range (above). We had no injuries (some bumps, bruises and scrapes, sure, but no fractures, stitches, sprains, dislocations--no injuries that took a player out of practice/play, or necessitated a visit to a doctor or hospital) in this, our inaugural year. We had more kids come out and try rugby, and we managed to finish the season with 18 hard-core, super-dedicated young touch rugby players. We had two viable teams at U-11 and U-13, with many of the U-11s playing up to play touch with the older kids. This was the first year for the FHYAA awards program, and the first FHYAA Rugby Volunteer of the Year was (reluctantly) John Dacey. 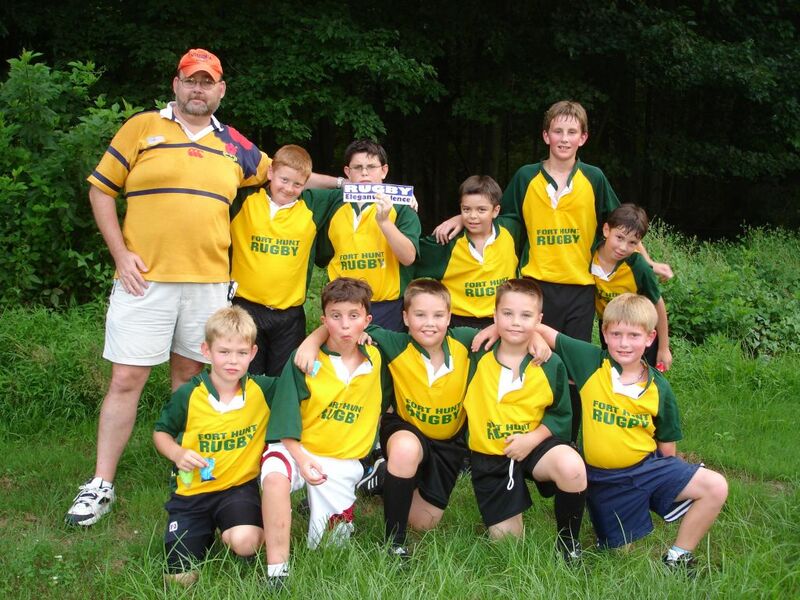 The program exploded in 2008, with 53 kids coming out to play rugby. We played tackle for the first time, playing tackle at the U-13 and U-15 levels, and doing surprisingly well with our speed and aggressiveness in contact, especially at the tackle. Our most impressive showing was against Vienna with our U-15s, posting a score of (approximately) 62-10 win in a 40-minute match. Big thanks to Bobby Strawbridge (shown below doing what he does best), our first real-live European home-country coach, for stepping up to assist with the leadership and training. Also big thanks to Jim Woods, a complete newbie to rugby, who started with us in 2008 and took to it and took charge of the U-9/U-11 touch sides for almost all matches. 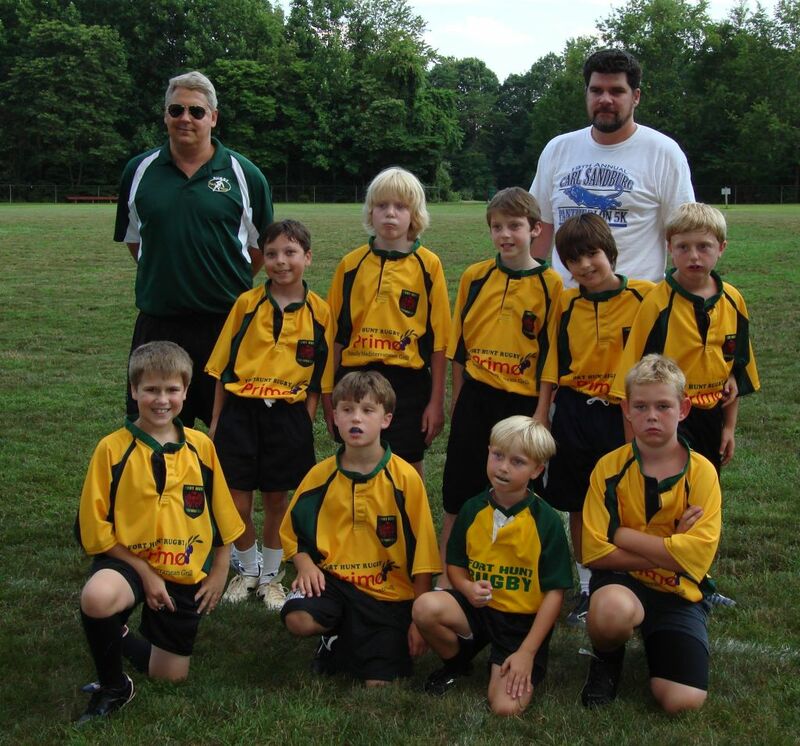 We took our U-9s on our first road trip, out to Winchester to play, and a very narrow loss. Our FHYAA Rugby Volunteer of the Year was Kelly Perconti, for her tireless and super-enthusiastic efforts to run the highly important social end of the program, showing all of our parents and visitors what excellent hosts Fort Hunt Eagles are. For the third straight year, and with the introduction of two tackle sides, we had no injuries. This was the first year of the free spring break clinic, and we will continue this in years to come. We had a total of 25 dedicated rugby players come out over five days, to build skills and to learn about rugby, all free of charge. Congratulations to Patrick P and Austin L as the most improved/dedicated players of the week. The summer season was our best yet, with 76 registered players. We fielded four full teams at U-11, U-13, U-15 and U-17, and made every single one of our scheduled matches, on time and with players sufficient to take the field. 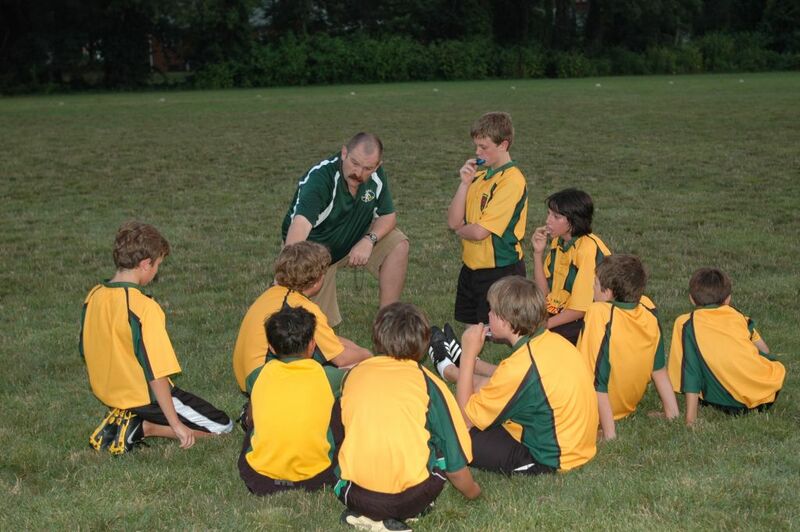 We moved up to a full season of playing tackle for the 13s, 15s, and 17s, and the season went very well. Our U-15 side was especially impressive, with lots of depth, cohesion and athletic skill--these players should make for impressive U-15 and U-17 teams in 2010. We fielded a Fort Hunt-pure (no outside players) U-11 touch team and a U-15 tackle team in the end of season tournament, and both moved forward into upper divisions before being knocked out. Unfortunately, we did sustain a few injuries this year, all of them with tackle players, which was sadly inevitable given the number of players playing full-contact tackle rugby in three age divisions. Happily, we had no serious injuries such as concussions, broken bones and received no stitches, but we did suffer separated and bruised shoulders, a major charley horse, a black eye, and the typical scrapes and bruises resulting from tackle rugby. Click here for a document providing a consolidated rundown of our 2009 summer season. Check out the 2009 scoring stats to see who racked up points, and who our men/ladies of the match were. From 76 players in 2009, we moved up to 93 registered players for Summer 2010. Lots of seasoned rugby players returning, and a lot of new faces, in all of the age groups. We fielded six full teams this year, at 9-and-under coed touch, 11-and-under coed touch, boys 13-U/15-U/17-U tackle, and girls tackle. All six teams played their entire schedules, making all scheduled matches with sufficient numbers to play. We undertook the first-ever club tour, a 16-and-under tour to Ottawa, Canada. We played five matches in 3 days, going 2-3-0 against some very serious competition, and learning a lot in a very short period. We lost only to 3 all-star sides, beating both club sides we played. We fielded all six of our teams in the end-of-season tournament, and played all scheduled matches with all of our own players, borrowing only a few to round out our sides. We had a few more intense injuries this year, what with all of the tackle we were playing. We had a few stitches, a broken wrist, and a broken foot. Again, nothing major. We began 2011 with our first-ever high school teams. We fielded both boys and girls teams, and played all of our scheduled matches. Both teams finished with winning records, and both teams went to the state championship semi-finals. Our heightened effort did result, however, in a few more serious injuries, with a couple of broken ankles, some knee injuries, and a clavicle injury. Our summer program registered almost 70 kids, down about 20 from 2010, owing most likely to high school age players having played their spring season and then taking the summer off. We formed teams at U9 and U11 touch, boys U13 and U15 tackle, and a girls tackle team. Unfortunately, the girls tackle team ended up with no opponents, making us the de factor summer champions! Both touch teams and the two tackle teams played in the end of season tournament, with the U11 touch team winning hardware for the Plate championship. We made huge strides in coaching certifications, with the majority of our coaches now certified at USA Rugby Level 1, and one coach certified at Level 2. We also had four of our boys high school players volunteer as player-mentor coaches during the summer season. We acquired a lot of new gear, including tackling dummies and rucking pads, and a brand-new, English-made scrum sled, funded by FHYAA (thank you!). The sled proved exceptionally useful in training our high school teams, with some other teams actually coming to our practice sessions so they could use our scrum sled as well. We started our high school program in 2012, and did surprisingly well. The boys managed to win the state championship in their very first year, and the girls came in 2nd place. Both the boys and girls HS teams made the playoffs but did not advance. The boys team undertook its first ever international tour, traveling to Madrid and Zaragosa, Spain, then to Toulouse, France, posting a 1-2 record. Boys state champions once again, turning in an undefeated season. The girls finished for the second year in a row as the state championship runner-up. The HS boys toured once again, traveling to Belgium, where we went 5-2-1, doing exceptionally well in a major European tournament, the only American team in the field. The boys went to the first Leicester Tigers clinic at the university of Mary Washington, and the girls returned to the Penn State clinic in January 2015. The boys came in #2 in the state, losing in an absolute heartbreaker to West End in the final seconds of an excellent match. The boys won the state champsionship once again, defeating Prince William. The boys finished the spring season ranked #4 in the country as a club/multi-school team, our best ever ranking. They were invited to the invitation-only national championship tournament, but declined to participate. The boys HS team plans to tour again in March 2017, destination currently undecided.